Children between ages 2 and older are welcome to come to the Children's Center which opens at 10:50 AM before Sunday worship. Go through the double doors at the back of the sanctuary, turn left and the room is on the left side before the staircase. You will have to sign in your child. You and your child will get matching bracelets. There are two trained staff. The door is kept locked from the outside while your child is in the room with staff. Ushers will periodically monitor this room and the church building during the worship service. Every volunteer is required undergo screening and annual training in compliance with our church insurance company that is focused on protecting our children and youth. 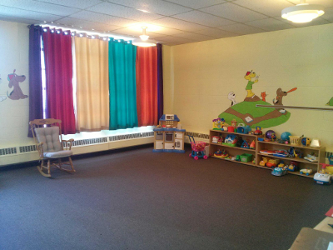 In addition to our child care room, our nursery, although not staffed, is open for anyone who needs privacy with their child. © 2016 Memorial Park Baptist Church, Vestal NY All rights reserved.